Next time you're strolling through a museum, pay attention to just the colors of the paintings and the years. Notice anything? Paintings have been getting progressively bluer. Or, to put it another way, blue is becoming "the new orange," says Martin Bellander, who put together this chart analyzing color usage in over 120,000 paintings. 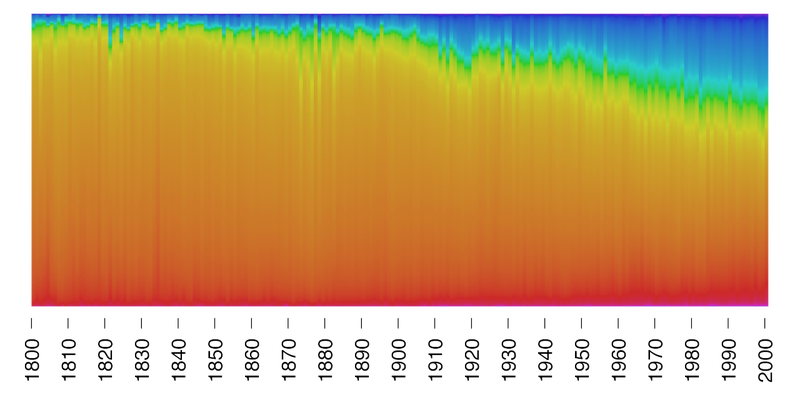 To make this visualization, he scraped data and images from the BBC's database of famous paintings through the centuries and analyzed which colors predominated. Orange is, indeed, far and away the most used color in paintings through the 19th century, and then the usage of other colors — blue, in particular — start to creep upwards so that by our own time, the color spread is fairly evenly spread across the spectrum. Why exactly this happened isn't clear. But just as interesting is the question of how far we can expect it to go: Will the current state of more-or-less color equilibrium hold, or will a similar chart a few centuries from now show blue sweeping the field, just like orange used to? You can check out the whole thing, including a detailed accounting of the process, over at Bellander's blog.